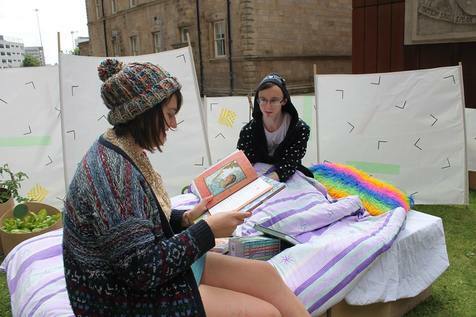 Bedtime story is a performance constructed specially for the Vantage Art Prize 2013. The performance was inspired by parents reading bedtime stories to their children, this then lead on to the idea of a performer being read a story by an audience member. By being based around this act, the audience member or participant is transformed into the performer and the designated performer becomes a prop, similar to those that surround them. This performance is a continuation of the piece performed for the Vantage Art Prize 2013 entitled Bedtime Story. As opposed to its predecessor, it is not an interactive piece; this performance shows the lack of interactivity and Intimacy in placing a child in front of a Television watching a video. The final performance in this series was the reprisal of the original performance from Vantage Art Prize, which I performed at Broadcast Leeds Festival alongside Yorkshire Sculpture Park's Dream Booth.